Madcapra's two Sara(h)s are at it again. 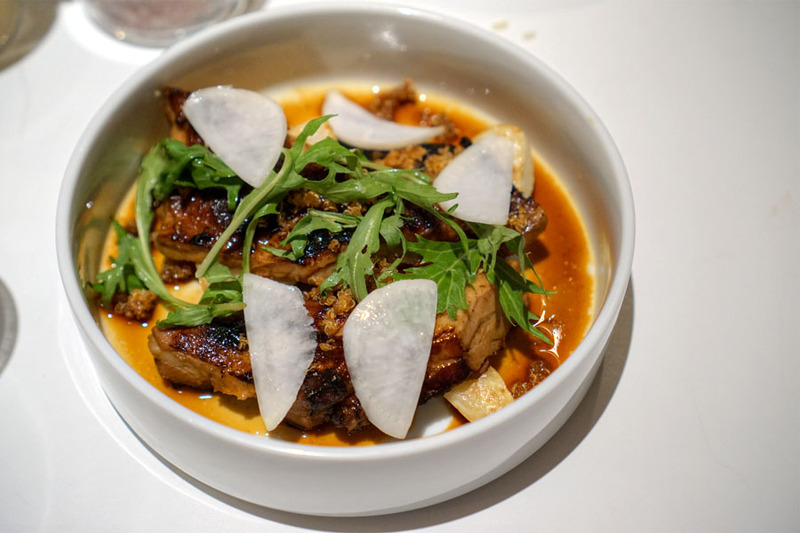 On January 14th, Sara Kramer and Sarah Hymanson opened Kismet in a Los Feliz-adjacent section of East Hollywood. 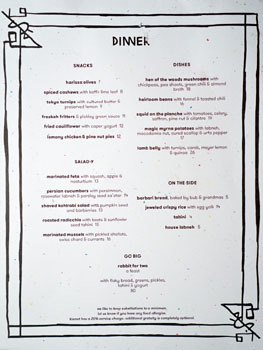 It's the sit-down place that they'd wanted to do all along, one serving casual Cal-Mideast cuisine throughout the day. Famously, the restaurant was opened in concert with Jon Shook and Vinny Dotolo, and not-so-famously with Benedikt Taschen, the German publisher who's also involved in some of the Dudes' other ventures. Joining Hymanson+Kramer in the kitchen is Pastry Chef Meadow Ramsey, an alumna of Sqirl, Industriel, Campanile/The Point/The Tar Pit, O-Bar, Gramercy Tavern, and Craft. In the FOH, GM duties are being handled by Eric Murdoch (Cliff's Edge, Parts & Labour in Toronto, Momofuku Noodle Bar), while Roni Ginach (Cliff's Edge, Domaine LA, The Musket Room and Barboncino in New York) serves as Beverage Director. Kismet takes over the spot that once housed Mother Dough, True Blue Tattoo, and clothier Rumors LA. The long-ish, 45-seater space was completely redone by Jeff Guga, the guy who was also behind Jon & Vinny's, hence the similarities in aesthetic. 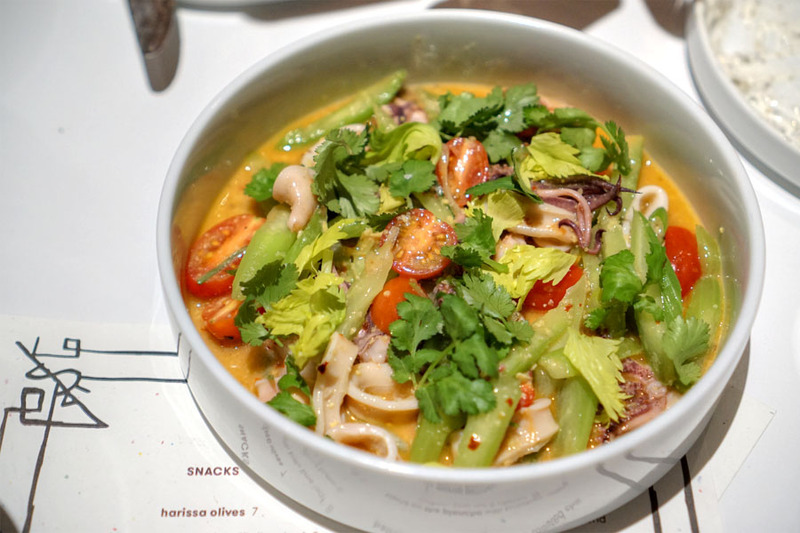 As for Kismet's menu, you get dishes of various formats that seem to draw from across the Middle East and Mediterranean regions, with an emphasis on veggies. 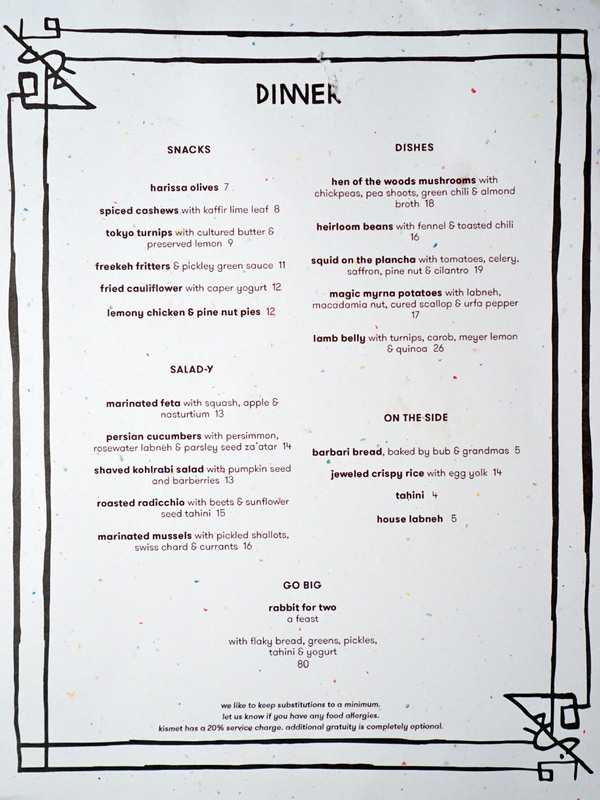 There's also a separate, more casual daytime menu, and a mid-day snack selection, but no dessert menu (the one dessert on offer tonight was sold out). To drink, Ginach has got a compact-but-interesting wine list going on, a couple low-ABV cocktails, and about a half-dozen ciders 'n' beers. Corkage is $25 a bottle. Click for larger versions. It took a while for our table to be readied, so we ended up ordering a couple cans while we were standing around. 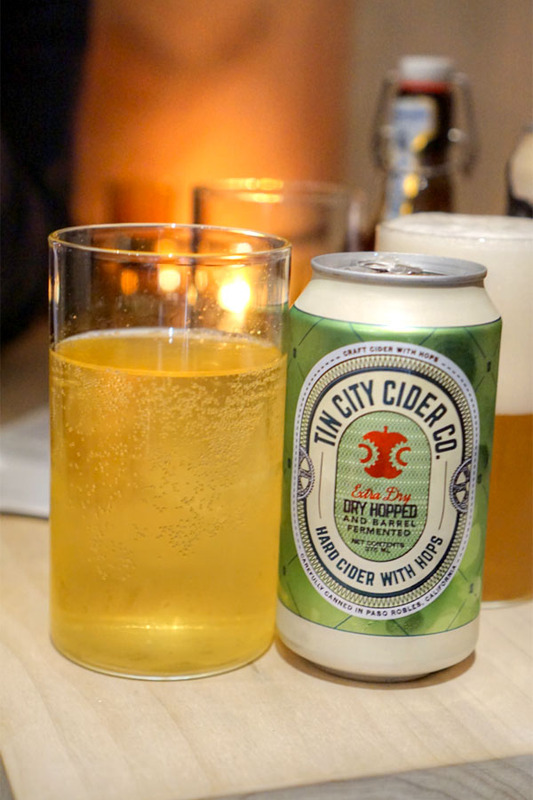 The tin city original cider paso robles [$8] was a dry cider, its flavors of apple joined by some vinous qualities and yeast, though I didn't get too much in terms of the advertised hops. 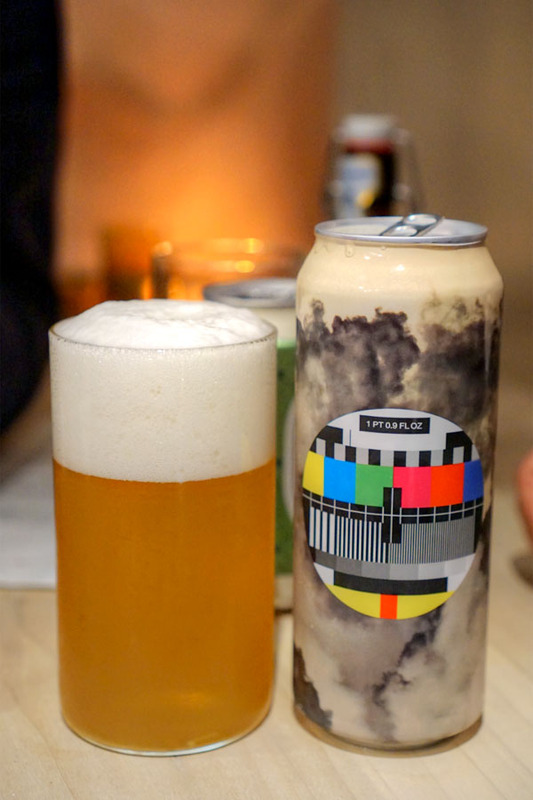 We also had the to øl gose to hollywood denmark [$9], a orange-infused gose that drank sour and distinctly citrusy, with a salty edge. Freekeh made for a fun start. 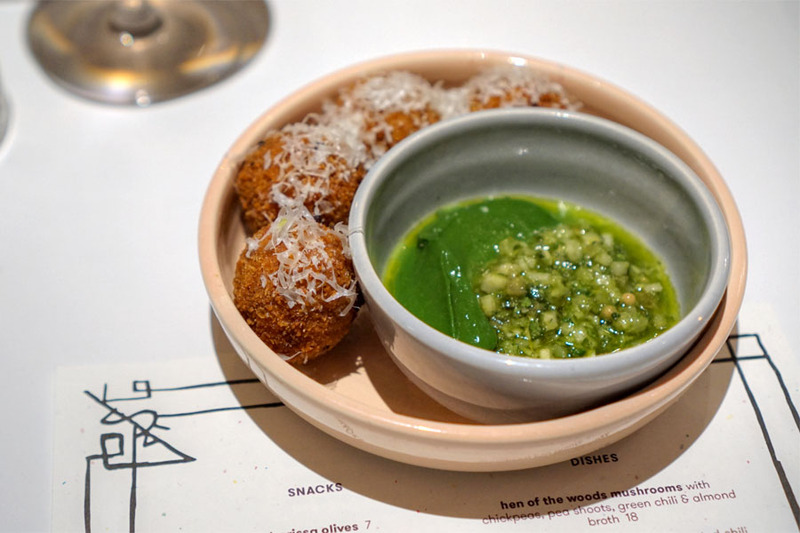 What I found interesting was that the fritters had a sort of savory flavor profile that reminded more than one of us of Chinese zongzi or the dim sum dish lo mai gai. Rather tasty, and even better with a dip into that super bright, super green condiment. 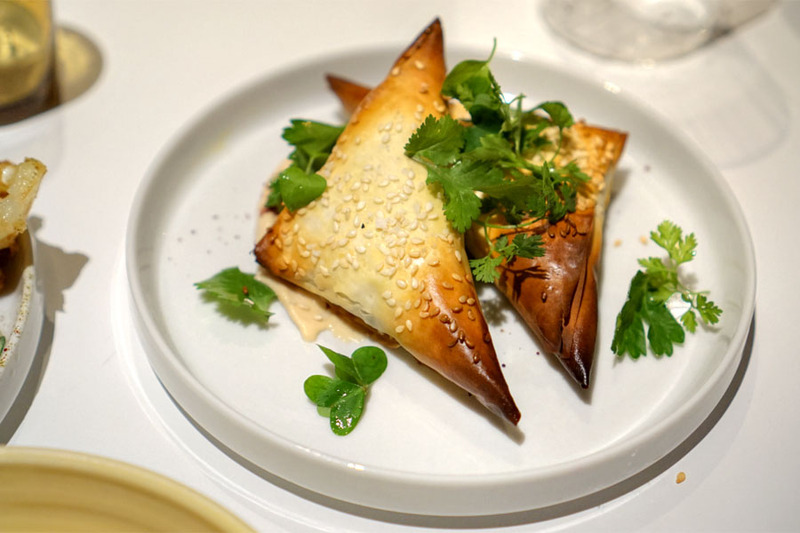 Triangular meat pies were warmly spiced and well-accented by the tanginess of lemon, while pine nuts provided for an additional textural element. I also appreciated the smears of tahini-like sauce on the bottom. Very tasty. I first had Bub & Grandma's bread over at Dune in Atwater Village, and ever since then, have had high expectations for their product. 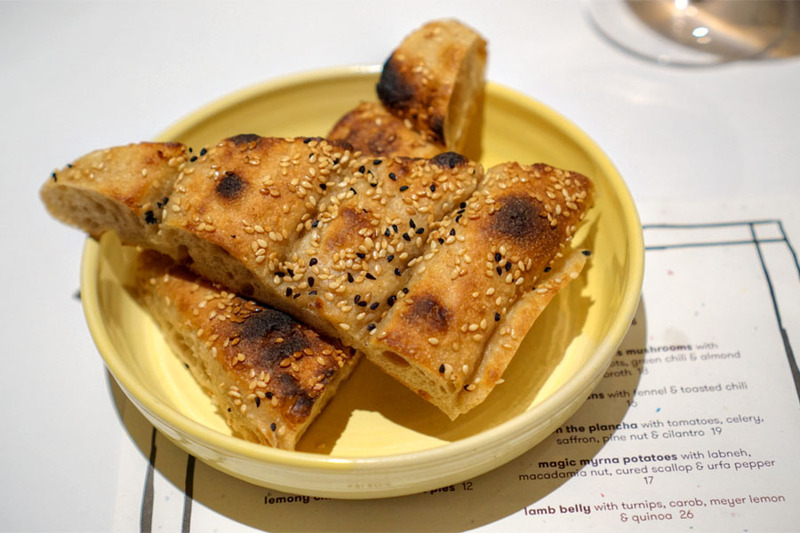 Their take on nan-e barbari didn't disappoint tonight with its crunchy textures, char, and loads of sesame goodness. Actually, I found this a little reminiscent of the zhima da bing oft seen in Chinese Islamic restaurants. Definitely worth getting. 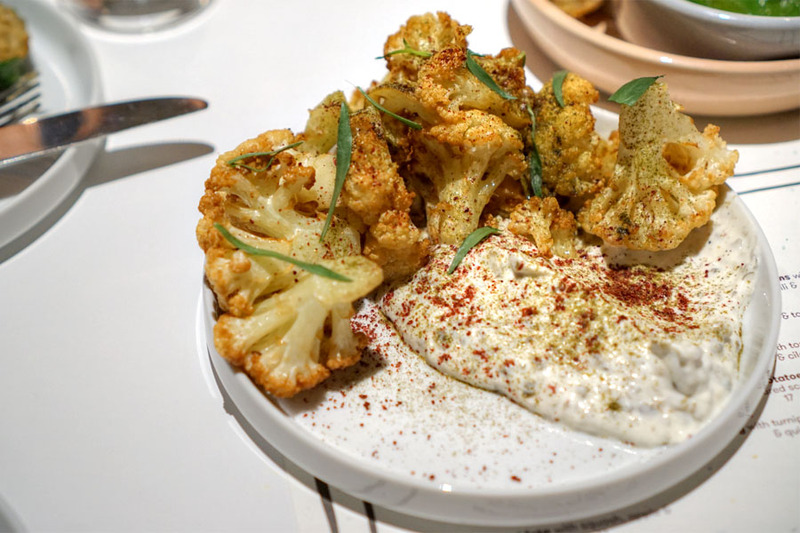 I felt that the cauliflower could've been a touch firmer, but it was pretty much spot on in terms of seasoning, and came well-matched with that cool, tangy, spicy yogurt. 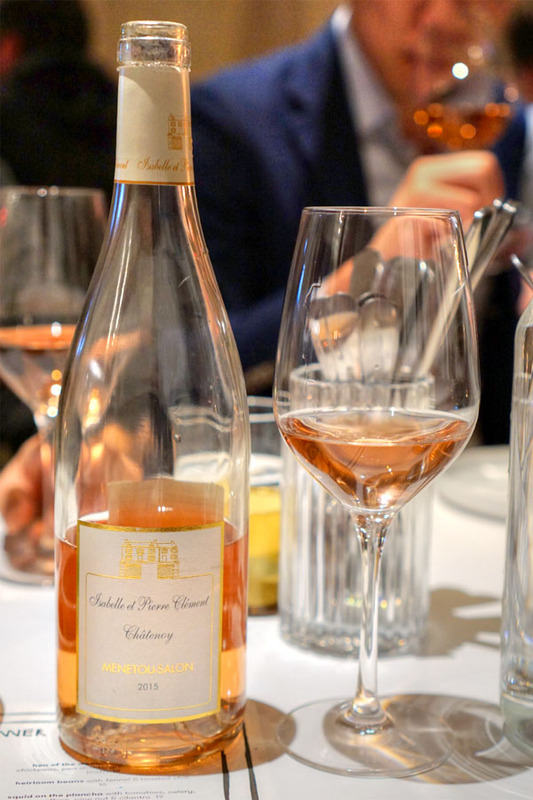 We opted for a Loire Valley rosé to start, the 2015 clément châtenoy menetou-salon pinot noir [$70]. Nose was sweet, soft, with berry fruit at the forefront and traces of minerality. Palate-wise, I got even more of those minerals, more of that red berry, making for a fresh, easy drinking experience. Squid arrived snappy and very, very briny, so the brightness of the veggies (especially the celery) was crucial in providing a sort of counterbalance. I would've liked more from the saffron and pine nuts, however. I was a fan here of how the bitterness of the radicchio evened out the potency of the beets. I got a sweet, almost candied finish to the dish that I enjoyed as well. 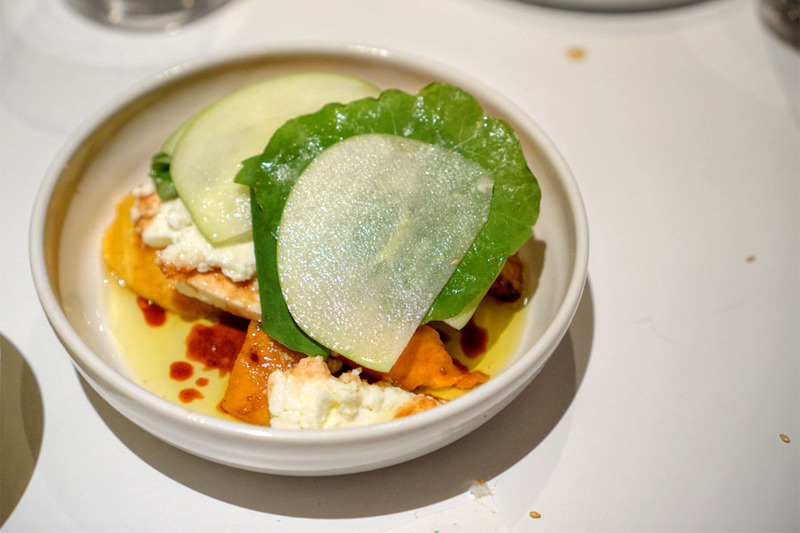 The richness and salt of the feta was forcefully conveyed in this course, and matched particularly well with the sweetness of squash and juicy slices of apple, all while nasturtium added a bit of tanginess to it all. 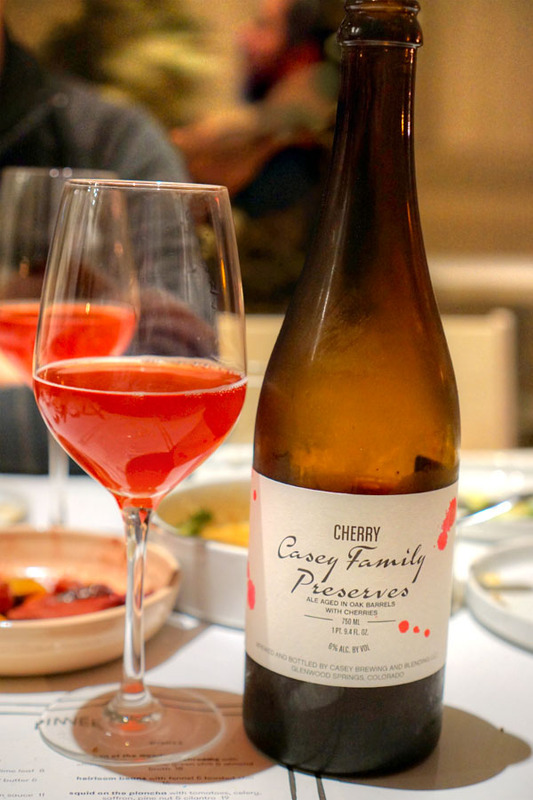 The staff was kind enough to waive a corkage fee since we'd purchased a bottle, so we opened up the 2016 Casey Family Preserves: Utah Giant Cherry, a farmhouse ale aged in oak with the advertised fruit. This one smelled of tart cherry, unsurprisingly, and had a touch of cough syrup character. In terms of taste, think light funkiness at first, transitioning to a balance of sweet and sour cherry flavors. 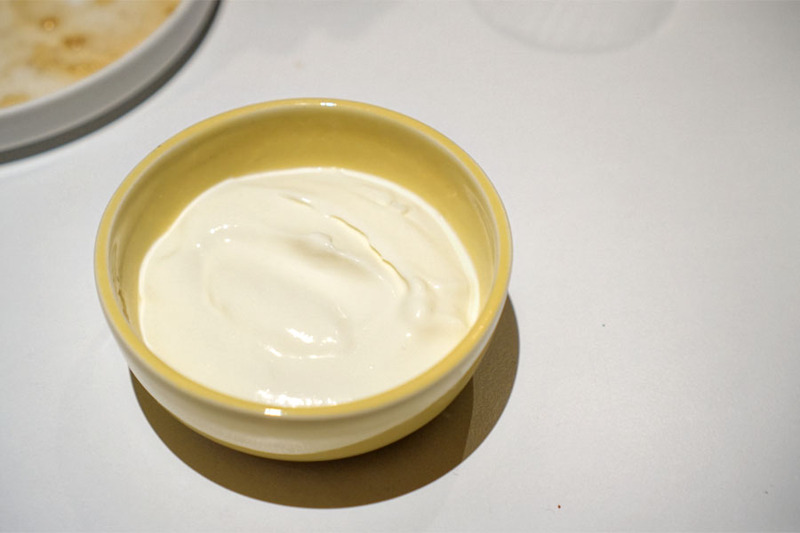 A side of yogurt to go with a couple of the dishes to follow. 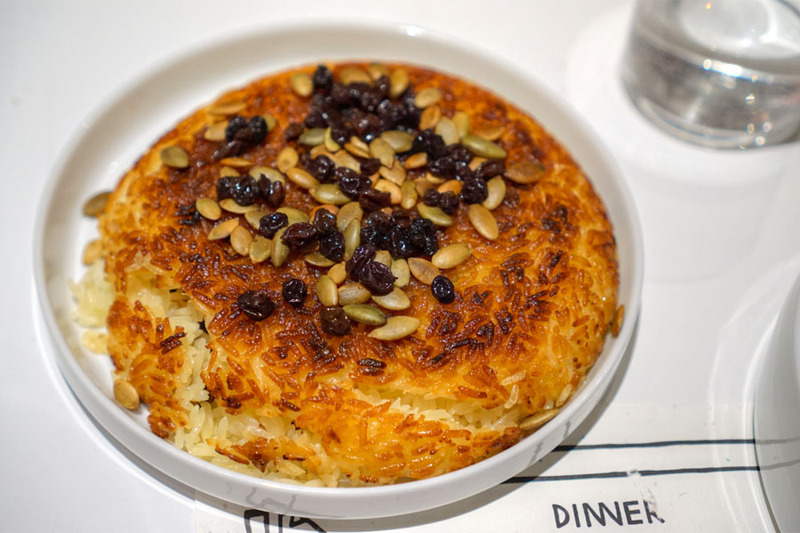 Kismet's take on tahdig was a highlight for sure. I loved the crispness and char of the rice, which came out crunchier than any nurungji, guoba, or socarrat that I've encountered. The roastiness of the rice worked beautifully with the sweetness of the fruit, and the lushness of the runny egg and tartness of the labneh above completed the experience perfectly. 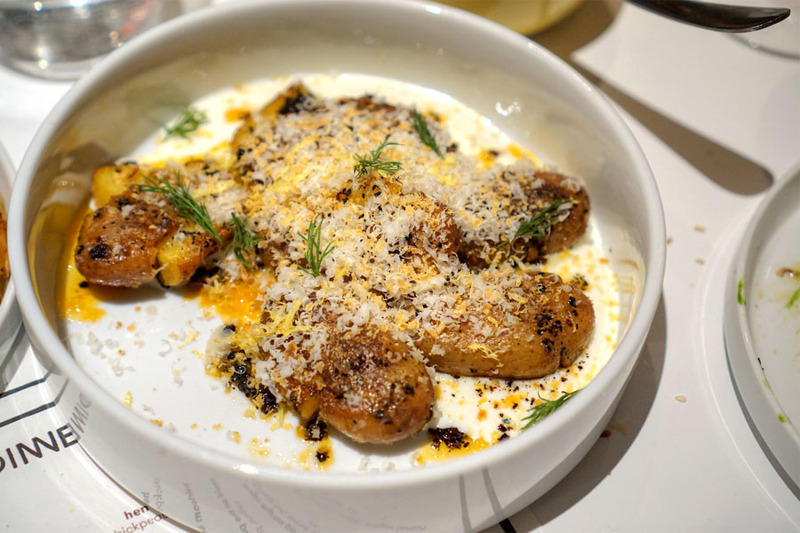 Potatoes were hefty and hearty, with a subtle sweetness. 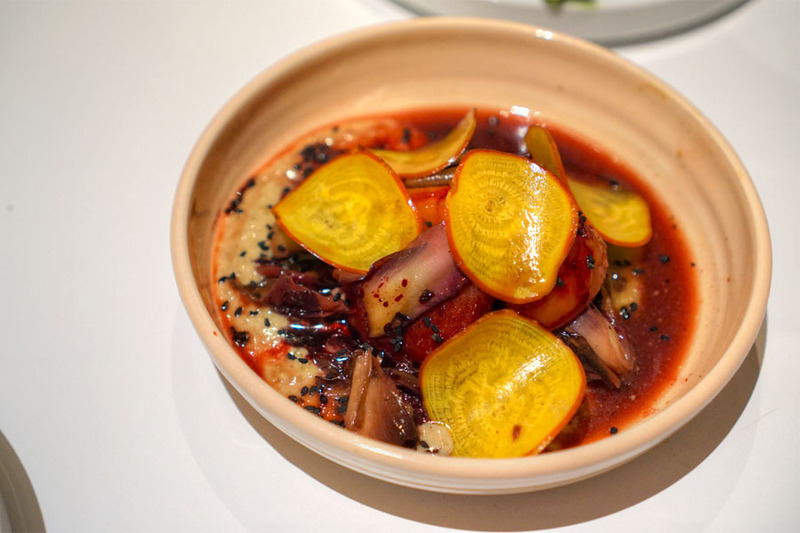 They meshed seamlessly with the brine imparted by the scallop and heat of the peppers. Superb with an extra dollop of labneh. 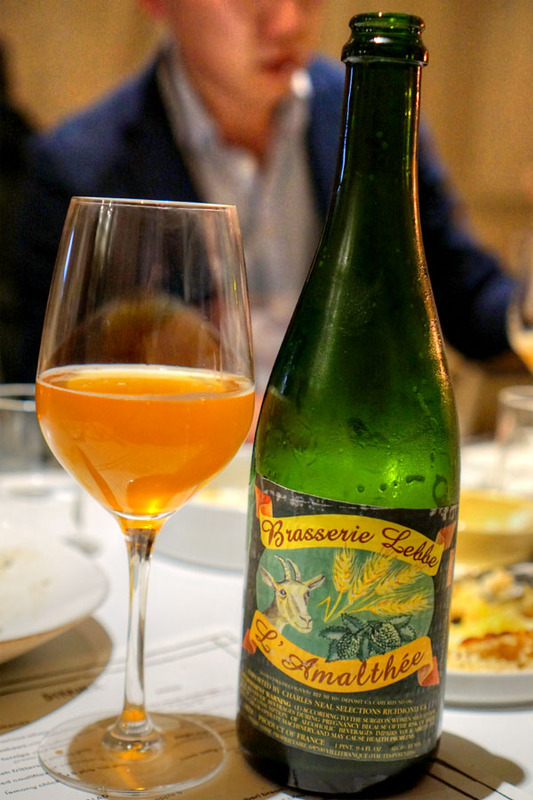 Next to drink was the brasserie lebbe "l'amalthée" farmhouse ale france [$20], done in what I believe to be the Bière de Garde style. Nose of sweet malt and bread, with a slight bitterness. The taste went sugary, malty, a touch yeasty, with again a bitterness backing everything up. Maitakes were earthy and umami-laden, and paired effortlessly with the zestiness of the accompany greenery. I was also a fan of the garbanzos, which provided a weightiness to the dish. 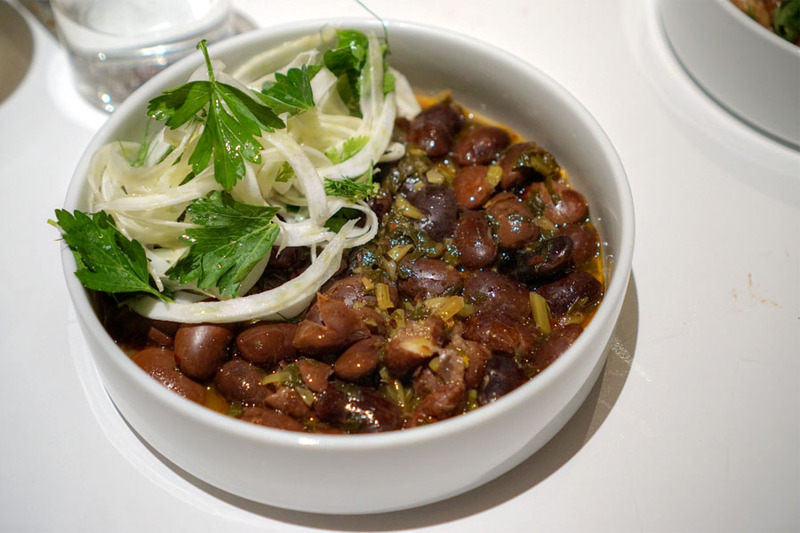 Beans made for a substantial course, one infused with plenty of sweetness and spice. Strands of fennel, meanwhile, provided for some zippy flavors that helped lift the dish. Last up was the lamb belly, a properly rich, fatty preparation with a mix of char bitterness and sweetness from the carob. The quinoa worked to temper the strong flavors at play, as did the radish and arugula up top. 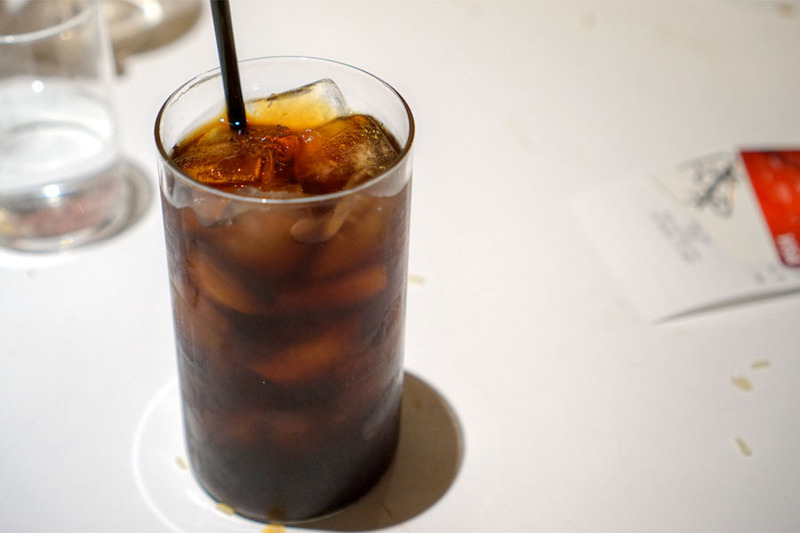 Since the kitchen had unfortunately run out of the lone dessert, we closed with a delightfully bitter, spicy turkish iced coffee [$5]. Kismet looks to be a logical, effectual expansion of Hymanson and Kramer's efforts over at Madcapra. 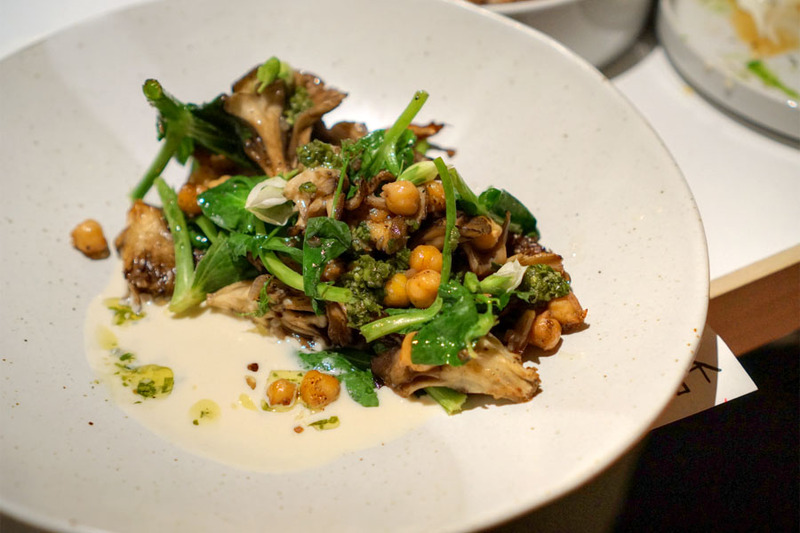 The cooking's inspired by the Middle East region, but shows off a Californian bent and a sort of relaxed modernity that make the restaurant a fairly unique addition to LA's dining scene. I've heard some criticism that the place veers overly "hipster," and it may (indeed, I felt like the least "hip" person in the room), but it all works. I went for brunch yesterday, and it was a very well-executed meal. The shakshuka could've been spicier and the egg could've been cooked more, but that barbari bread is probably best version I've ever had. Review coming up soon! This place is great, come here can both travel and can enjoy delicious food.